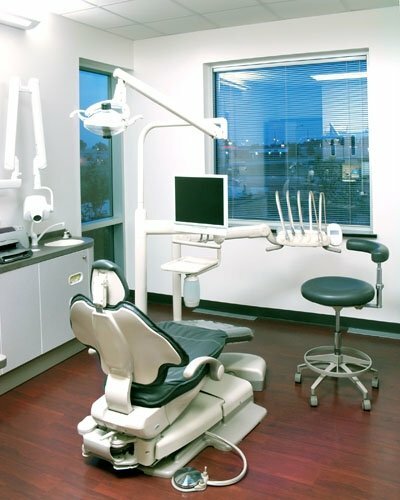 By now you're probably wondering: What does my dentist have to do with all this? 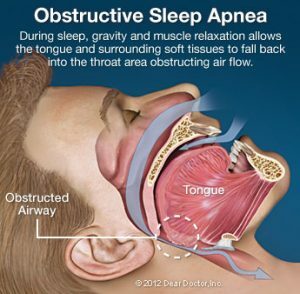 Here's the connection: Snoring or sleep apnea can sometimes be treated with an oral appliance available here at the dental office that's designed to hold the lower jaw forward during sleep. This repositioning of the jaw moves the tongue away from the back of the throat, reducing the potential for obstruction. This treatment is backed by a great deal of scientific evidence; it's a good remedy to try before moving on to more complicated breathing devices or surgery to remove excess tissues in the throat. Only a dentist can fabricate, fit, adjust, monitor, and treat complications associated with Oral Appliance Therapy used in managing SRBD. 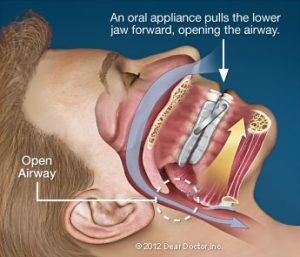 So if you or a loved one is experiencing any combination of the signs and symptoms mentioned above, please come in and talk to us about Oral Appliance Therapy (OAT). Even if something beyond OAT is called for in your particular case, we will make sure you get the help you need.